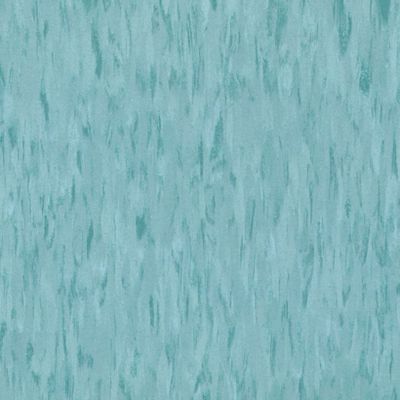 The original minty aqua tiled counter top in my 1952 bathroom was finally beyond saving. The previous owners had used a paint stick to make the grout look good in order to sell the house. Several pieces of that tile had cracks or chips and with the grout in such bad condition we decided to take it out. As all of you readers know, tearing out original features in an old house always ends of being full of surprises and thus more cost than you ever anticipated. The Original Tiled Hall Bath is (almost) Done! The wall tiles in this bath match the Universal Rundle Desert Tan fixtures. Since the minty aqua tiles on the counter top were not used anywhere else, I decided to eliminate that color from the new decorating theme. You might remember the color from this older photo. The counter top had a deep tiled edge so we had the new laminate made the same way. The first order of business was to take out the counter top and sink. As most know, these old tile jobs are set in cement with wire lathe and black tar paper. What a mess. I managed to save a few tiles which I will probably throw on eBay for someone else trying to save their original bath. Of course all that hammering and chiseling knocked a few pieces of wall tile lose. There was #1 of unexpected issues. Those tiles seemed to be attached to NOTHING. It was then decided that the counter top would now require a back splash (and more $$$) to hide that issue. The original sink was made to be “tiled in” and since I was going with laminate I had to have a different sink. I found an oval sink that accepts a (period perfect) Hudee ring and special ordered it though our local Menards store. The Hudee ring was picked up on Amazon. I kept my faucet since it was in great condition and fully functional. And while we were at it, I had the contractor re-grout the wall tile around the sink area. It now looks so good (and clean!) we are going to have him continue on and do the whole bathroom. I am tickled pink (or peach) with this new project. The white sink and bright counter top have really brightened up this bath. While we had the mess, the walls and ceiling got a new coat of paint. All I have to do now is shop for towels! 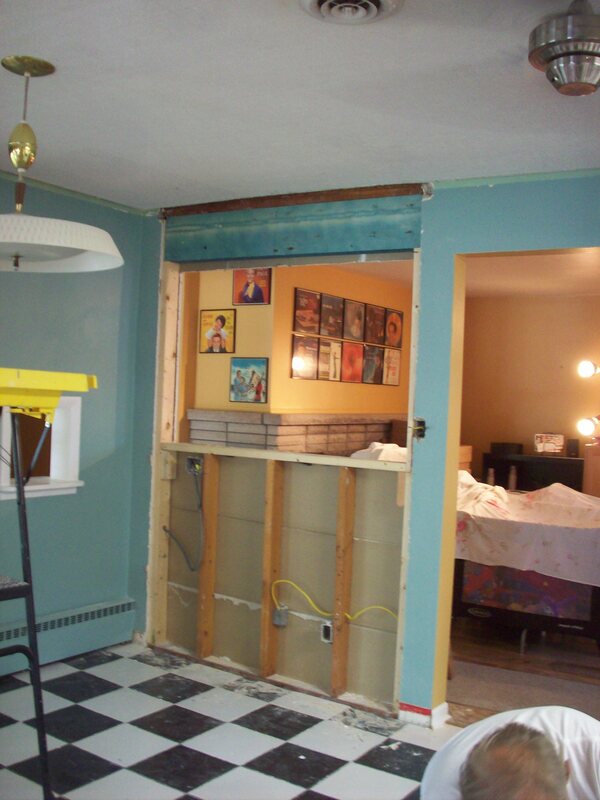 Oh how I wish our kitchen reno was going as fast as they do on HGTV or DIY. You know, 24 hours and you’re done. The paint is even dry. Instead our reno is crawling at a snails pace. My DH works a crazy shift schedule of 12 days straight while trying to help our contractor to save us money. Added to the mix were a tornado, torrential rains and flooding in my area which left most homeowners with flooded basements and crawlspaces, leaking roofs or other storm damage. In addition to their own home issues, our contractor and our plumber were called off of their “non-emergency” jobs to help those in need. We were very fortunate that our basement remains high and dry. Even with the set backs we have still managed to get some things done. 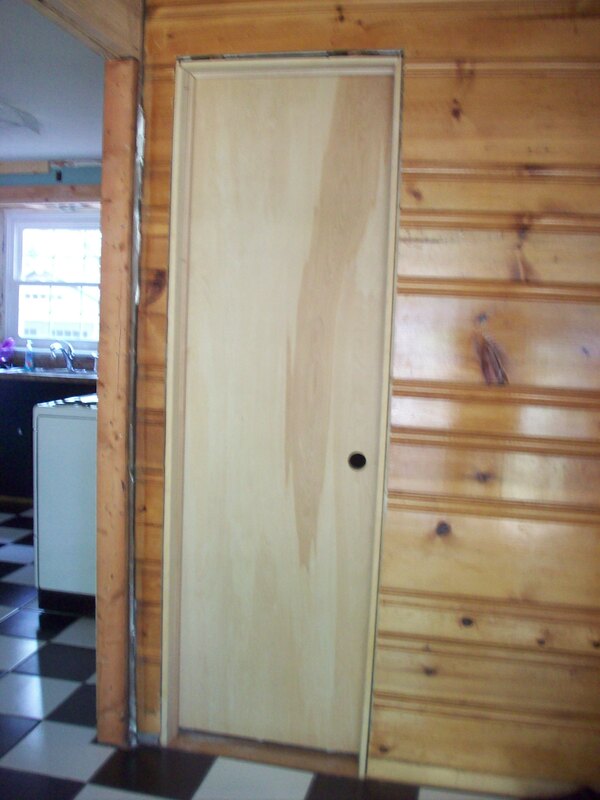 Here is the new bathroom door, moved around the corner into the old mudroom. But that was not without a hitch. Seems there is a nice big cast iron pipe running up that wall. Within an inch of the doorway. A few re-adjustments later, we have a door. Another header was also installed into the opening for the bar in the living room. We can now see the fireplace! The drywall men are scheduled to be here soon so we have a few things to finish up before they arrive. I am still mulling over paint samples for the kitchen. 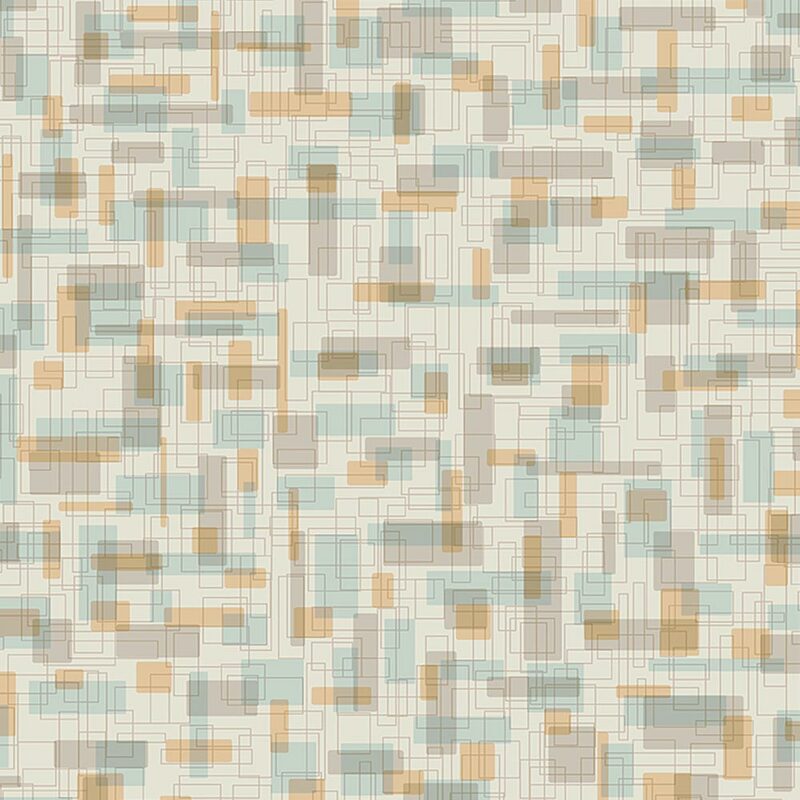 I am undecided on which way to go: orange, aqua or gray. I would like to tie in the colors of the counter top and flooring. 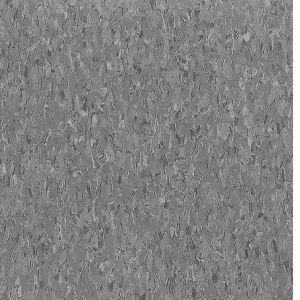 Here is the Wilsonart laminate we are using for counters AND backsplash. The pattern is called “Betty”. My usually orderly home is upside down with the mess. We have cabinet boxes in the living room and basement family room, ceiling tiles and light fixtures in the guest room and new appliances in the garage. And most of my kitchen is packed up in boxes strewn all over the house. We are still eating on throw away dishes. Really my only escape is going to bed. And then I have to straddle our living room area rug, which is rolled up next to the bed. I know I know! I did not think we would live here 4 years before we got started on the kitchen renovation. But we have begun! For those who may be purists, who might think that anything original (no matter the condition) must be used, you might want to scroll on by. 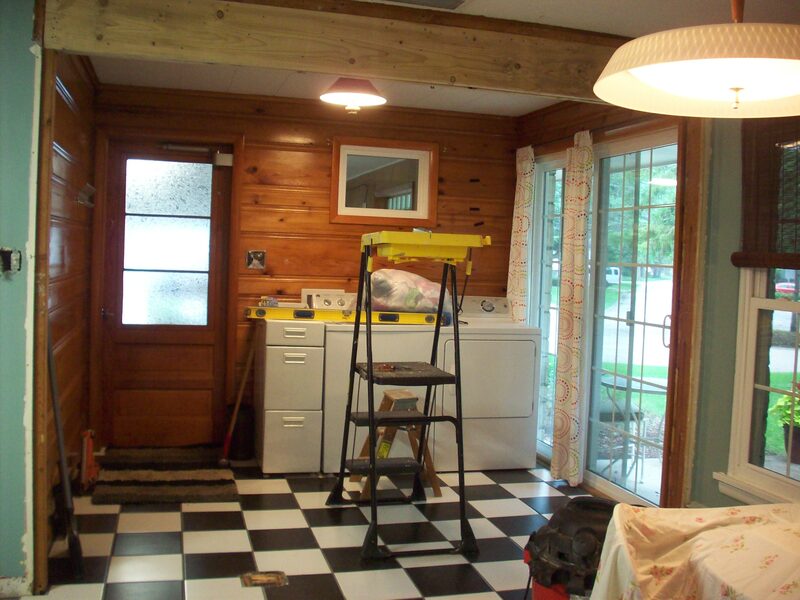 When we closed on the house, all that remained of the 1952 kitchen were the too small/ dirty/ poorly painted wood cabinets, the exhaust fan and the attached knotty pine mud room. 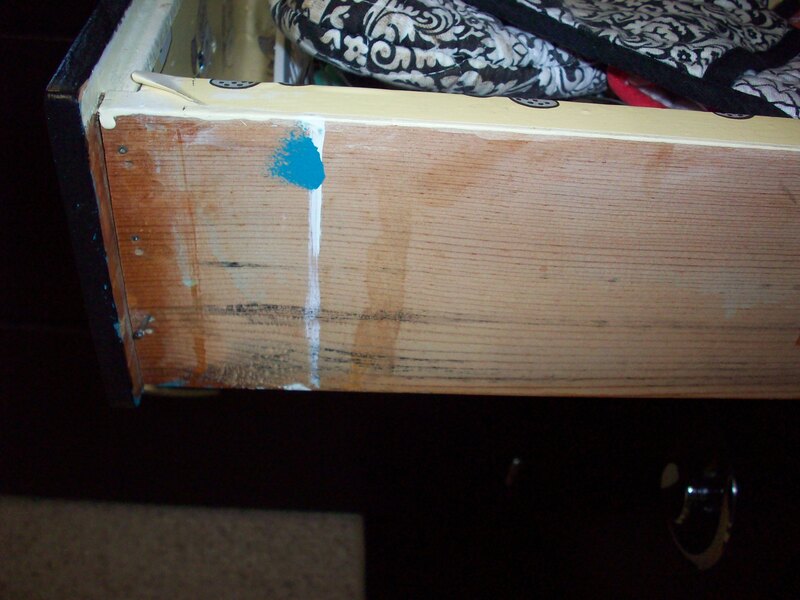 Unfortunately the cabinets had been painted (many times) without removing the hinges, gooey food gunk or scotch tape. Other issues include the fact that they were built on site and the shelves were not adjustable and they were so small that I could not fit a cereal box or bottle of cooking oil in them. The floor, counters and back splash were recent upgrades by the last owners, sloppily installed for re-sale. There were no original light fixtures, hardware or counter tops. We did find what we think was part of the original counter tops in the basement. It had been used as a top on a hand-made work bench. 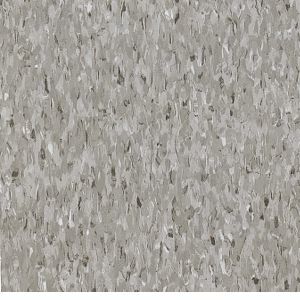 It was gray laminate with metal edging. All that remained was a small L shaped piece. 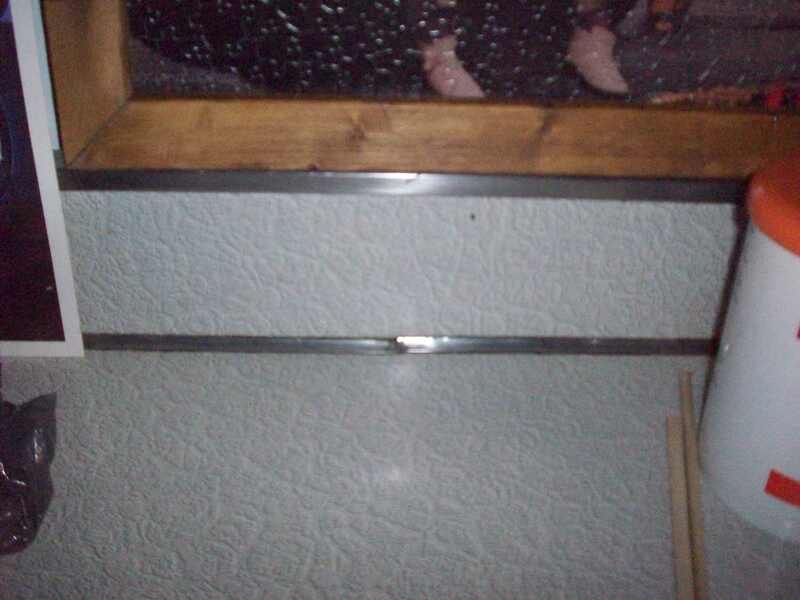 Here is the side view of one drawer in the kitchen cabinets. You can see the quality of work that was done in the kitchen. I just love that the paint was allowed to run down the side and that a nail was left sticking out. That glob of turquoise paint was the color that was under the black paint. Ever optimists, we made do with what was in place in this room. We cleaned it within an inch of its life, painted it a cheery aqua, added some NOS cabinet hardware found on eBay and a few vintage light fixtures from garage sales. 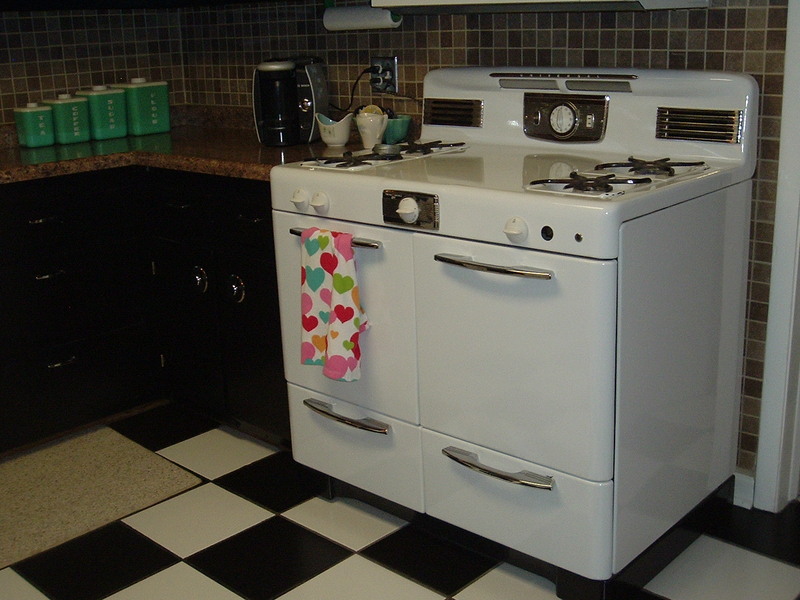 We already had an early 50’s 40″ Universal range which fit perfectly in the space. But, no matter how much we tried to make it LOOK good, the room was still poorly finished, not very functional and worn out. The dishwasher died right before the closing, so we were left with a gaping hole next to the sink. I tried to hide it with a skirt. Try to bear with me, as my next several posts will seem disjointed. We are gutting the kitchen and starting over in there, moving a door, opening up a wall to the living room, moving the washer and dryer out of the mud room, revamping the cabinets and vanity in the hall bath, and upgrading the 3/4 bath off of the kitchen. While we have the mess, we have plumbing, air conditioning and electrical work to do. My town does not have a Habitat Re-Store or re-use center. We don’t even have a Goodwill. The closest Craigslist area is 50 miles away. The resources are just not here to buy vintage and recycle. We have tried to leave what was original (and still functional) to stay true to the style and period of the home. Sadly, some things just could not be saved. 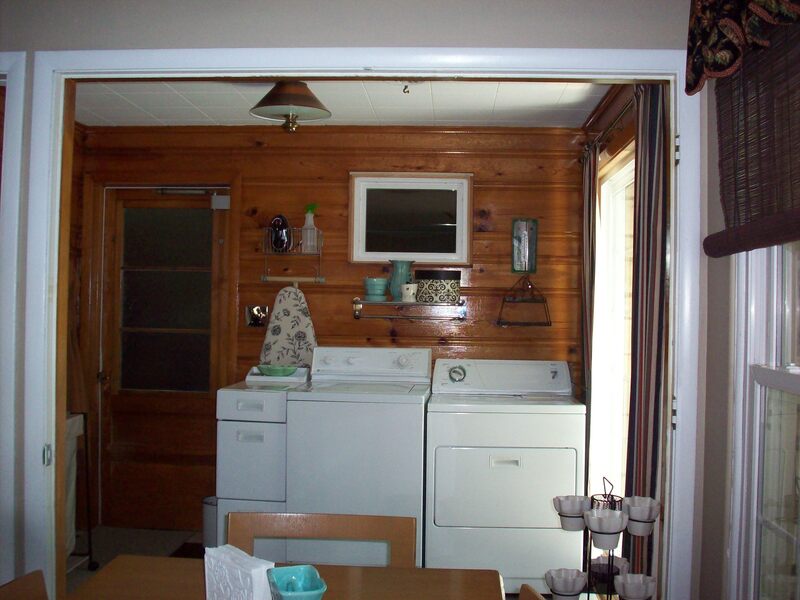 Never fear though, that knotty pine will stay put! Wait till you see what we found hiding in the hall bath. I have spent endless hours online, looking at retro laminate for counter tops and back splash, Sputnik style lighting and Armstrong VCT flooring. My UPS man is probably wondering how I could possibly need so many samples. Please check back as all this is happening RIGHT NOW.